E-911: Milo and Brownville Fire Departments provide fire protection for their side of the lake. The Piscataquis County Sheriff's Office provides law enforcement. For nonemergencies call 564-3304. The Three Rivers Ambulance Service provides the ambulance service. In an emergency situation, call 911, have your road number, your road name, and the name of the main artery your driveway or road runs from available to report to the dispatcher. Lake View belongs to the Penquis Solid Waste Corporation - Penquis Transfer Station. Stickers and station information are available at the Lake View Plantation Office. Hunting and Fishing licenses are available for purchase at the Lake View Plantation Office. Complete Motor Vehicle registrations are done at the Lake View Plantation Office as well as ATV, Boats and Snowmobiles. Note: All re-registrations can be done via the mail. Just call the office during regular business hours and get the information required with the cost and upon reciept of the funds the registrations can be mailed to you. We now accept credit cards (Fee of 2.95% or $3 minimum) to expedite the process! 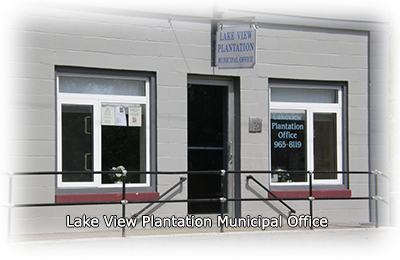 Contact the Lake View Plantation Office for property information. Property tax payments are received at the office, via mail or by phone with credit card (Fee of 2.95%, $3 minimum). Questions regarding the assessed value of your property? Contact Gerry Thurlow 290-7969. Building permits can be found online at http://www.maine.gov/dacf/lupc/application_forms/topten_list.shtml. Contact Keith Smith at 695-2466 with questions. Copies of vital records and dog licenses may be obtained through the Clerk, Barbara Reed at 207-943-5538. We are happy to announce that we now accept any major debit/credit cards! We use Municipay so there is a 2.95% fee (or $3 whichever is more) that will be added on to your purchase total. This is a service where the card holder pays the transaction fee instead of the tax payer. I can accept credit cards over the phone to eliminate the extra wait time of receiving funds by mail.